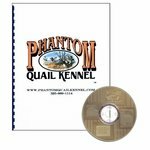 Phantom Quail Kennel Plans Book and CD. The "Johnny House" used by many to liberate and recall quail for dog training is not a new concept by any stretch of the imagination. 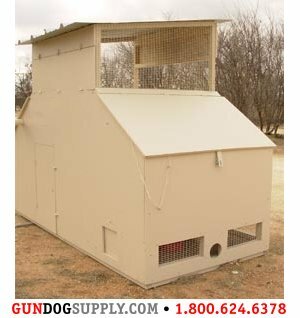 What is a new concept is a design that incorporates very little maintenance, ergonomics, dependable and repeatable callbacks, protection from the elements, as well as insurance against a varmint destroying your entire investment of birds. This design was born at Phantom Kennels in a pursuit to have a dependable population of liberated birds, and to build a system that requires very little maintenance. Most designs of the past have been high maintenance and offered only mediocre callback success with high mortality rates. Over the years the Phantom Quail Kennel has seen many improvements and modifications. Recently, the Phantom Quail Kennel has reached its final development, and are now being used daily to train pointing dogs with repeated success. The watering system consists of a 15 gallon plastic drum that is housed inside the quail kennel and gravity flows through 3/8" vinyl tubing to an automatic watering system. This system will give 40 birds clean drinking water for up to 8 weeks. 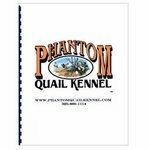 This is one of the most time saving features of the quail kennel. Using the adapter on the reservoir, barrel water can be added at any time and in small amounts as necessary. As an option you can divert the captured rainwater from the roof of the unit directly into the water barrel. The call back section is divided with mesh wire providing visual encouragement to the quail outside of the pen. There are three viewing windows into the callback section adjacent to the callback funnel. These can also be used to see how many birds have called back and to see a varmint before being surprised while opening the callback access door. Without the visual of the other birds, callback is average at best. The door to return called back birds is accessible from outside the unit avoiding human contact with the birds. The second key feature of this section is the varmint release / bird loading door. If you happen to trap a varmint such as a skunk, this door will allow you to release the varmint for extermination rather than soiling the inside of the callback. When stocking birds, the gate can be used as a controlled opening to keep birds from escaping before they have been trained. The ergonomics of the Phantom Quail Kennel allows you to feed, water, release birds, return call back birds, and visually inspect your birds, all from the exterior of the unit. This keeps bird/human contact to a minimum and makes this the most efficient design on the market today. The Phantom Quail Kennel is portable enough to be moved on a small trailer with two people yet stable enough to withstand high winds without anchoring the unit. 40 - 50 birds live a happy, healthy, life in the kennel. This gives you an ample amount to conduct several training sessions daily. Build two and place them an adequate distance from each other and either rotate the houses daily or have one for morning and one for evening training. There are two flight doors on opposite sides of the quail kennel. If your unit is set up in the middle of a small property birds can be flown in opposite directions. This gives you twice the coverage with only one unit. Sunning and calling platform With nearly 16 feet of platform birds have a generous area to call other birds and be in the sun. This is a favorite area in the early morning and late afternoon. These platforms also act as a staging area for birds to be flown for training. After building many of these, Phantom Kennels have created a system that will ensure success. 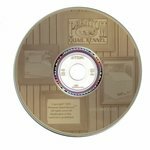 Using the detailed plans, materials list, and illustrated instructions this project can easily be completed in one weekend. Remember to check your local and state game laws as recall pens may not be legal in all areas; and may require special posting, permits, licenses, and / or leg bands.